creates a grid layout that has only one column. 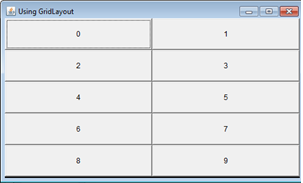 creates a grid layout with specified number of rows and columns. creates a grid layout with specified number of rows and columns, and spaces between components. In the example code below, a grid layout with five rows and two columns is created. Each cell of the grid contains a button object. When i use GridLayout to arrange component in a table form, all components are resized to fit the JFrame window. Actually, i don't want to the components to be resized in this way. Is there any solution? The solution is simple. Firstly, set the layout of the frame window to FlowLayout(setLayout(new FlowLayout()). Then create a panel container. You will need to set the layout of the panel to GridLayout. All your components will placed in the panel. Finally, add the panel to the frame window by using its add(Component c) method.